Black-bellied whistling duck, photographed at Green Cay Nature Center in Boynton Beach, Palm Beach County. The black-bellied whistling duck, Dendrocygna autumnalis, just might be the coolest bird on the planet. I mean this bird sports a Mohawk, after all. You just can't beat that. Whistlers, as they're commonly called, are year-round residents of South Florida, and as you might expect typically hang out in freshwater wetlands. Their range is mostly to our south, in Central America and South America, but also includes southern Arizona and Texas as well as the Sunshine State. It gets its name from, uh, its black belly and the fact that it sounds a lot like a squeeze toy. It is long-legged as ducks go, and it is the most erect of all ducks. The sexes are similar in size and color. The whistler used to be known as the black-bellied tree duck because it nests in tree hollows. It will also nest on the ground in grassy areas, or in brush, especially if there aren't any predatory mammals around. In dryer parts of their range, they'll take to cactus hollows near water. Generally, whistlers mate for life; males and females share the job of incubating the eggs and raising the brood, which can be quite large — a female can lay as many as 13 eggs. Females occasionally will "dump" eggs in the nests of other whistlers. Incubation can take about a month, give or take. The chicks, when very young, are striped black and white, almost like prison uniforms, with a blue beak. Extremely cute. They become more grayish as they get older. They're nest-bound for a day or two, then able to jump to the ground and forage for food with their parents. They fledge in about two months. Black-bellied whistling ducks forage at night, eating mostly wild plants and seeds. But they do feast in farm fields, eating corn, sorghum, rice, wheat and other grains. Occasionally they will eat bugs, fish and other aquatic morsels. They are gregarious birds, and will hang in flocks that can be as large as 1,000 individuals. The whistler population rates a "least concern" from the International Union for Conservation of Nature. Globally, they're actually growing in numbers, and their range is expanding northward in part because whistlers take well to human-altered terrain. 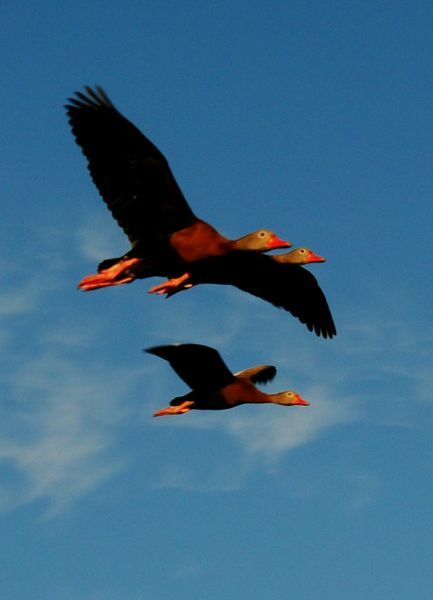 The Florida Fish and Wildlife Conservation Commission reports that whistlers are expanding within the Sunshine State. 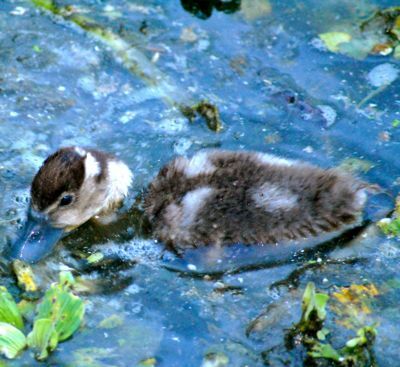 As with all wetland birds, loss of habitat and poor water quality are threats, however. Adults perch a lot, more than any other duck, in fact. 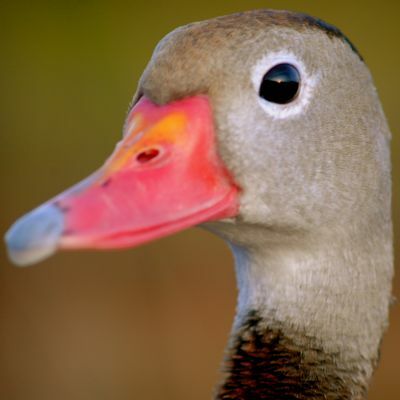 Their beaks are pinkish, with a blue tip. They have a white eye ring and a chestnut- colored nape that provides the Mohawk look. Black-bellied whistling ducks are members of Anatidae, the family of ducks, geese and swans.